Wear a helmet. Helmets reduce the risk of head injury by absorbing the energy of an impact. Wear protective eye wear. According to the Coalition to Prevent Sports Eye Injuries, protective eye wear designed specifically for the sport can prevent more than 90 percent of all eye injuries. Be alert - as a player or spectator! Sports-related injuries are the leading cause of emergency room visits in children ages 12 to 17 according to the Center for Disease Control. 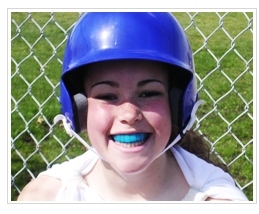 Whatever your sport, the right protective gear can save your teeth, your face, even your life. If you or your child suffers dental trauma such as a knocked-out or broken tooth, Dr. Godwin suggest that you contact your dentist for immediate attention. For those in braces, it's also important to contact our office to schedule an appointment for repair since damage to braces can lengthen treatment time and affect treatment results. About National Facial Protection Month: Every April, the American Association of Orthodontists, the American Dental Society, the Academy for Sports Dentistry, the American Association of Oral and Maxillofacial Surgeons, and the American Academy of Pediatric Dentistry team up to remind parents and parents, coaches and athletes about the importance of taking precautions to preserve their teeth and protect them from facial injuries.